Paternoster Resources (“Paternoster” or the “Company”), the London Stock Exchange focussed investment company, is pleased to announce that the Company has placed (subject to admission to trading on AIM) 4,500,000,000 new ordinary shares of 0.1 pence each (the “Placing Shares”) at a price of 0.1 pence per share with institutional and other investors to raise gross proceeds of £4,500,000 (the “Placing”). The Placing was oversubscribed and allocations were scaled back. 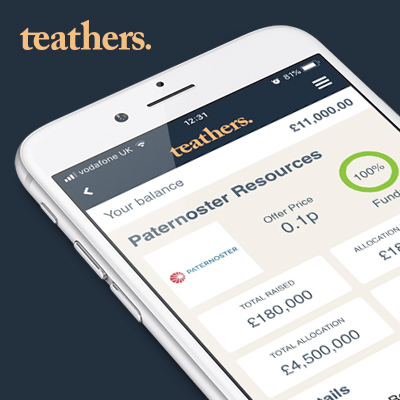 Teathers has secured an allocation of £180,000 in the Placing of 180,000,000 shares priced at 0.1p per share (the “Allocation”). Teathers will make its Allocation available on the App by way of a Live Market Bookbuild to onboarded users of the Teathers App. The Live Market Bookbuild will be conducted through the Teathers App and will involve the issue of up to 180,000,000 new Ordinary Shares at the Issue Price of 0.1 pence per share. The Live Market Bookbuild will commence at 9am on Tuesday 26 June 2018 and will close at 5pm on Monday 02 July 2018. Settlement will occur on Tuesday 03 July, on which date contract notes will be issued on completion of the deal. Application will be made for the Placing Shares to be admitted to trading on AIM (“Admission”) and it is expected that Admission will become effective on or around 4 July 2018. The Placing Shares will rank pari passu with the existing ordinary shares of 0.1 pence par value each (“Ordinary Shares”). About Paternoster & use of funds On 18 January 2018, the Board of Paternoster Resources plc announced that it had entered into an arrangement with RiverFort Global Capital Ltd, the specialist provider of capital to junior companies (“RiverFort”), whereby Paternoster would have the opportunity to invest in transactions arranged by RiverFort alongside other co-investors. On 20 April 2018, the Board announced that, as a first step in the development of this arrangement, it had agreed to invest around £250,000 in a portfolio of income-yielding investments arranged by RiverFort, which comprise investments in the form of both senior and convertible debt. This portfolio represented, on average, around 2.8% of the total investment amounts originally arranged by RiverFort and therefore demonstrates the scope for Paternoster to scale-up the size of its investments as it develops its relationship with RiverFort. This should enable the Company to quickly grow its portfolio with investments that can generate both attractive cash returns whilst providing downside protection. As a further development of the Company’s evolving strategy, Paternoster entered into an investment advisory agreement (“Investment Agreement”) with RiverFort. The Investment Agreement secures Paternoster’s access to RiverFort’s investment pipeline and enables it to utilise RiverFort’s investment infrastructure. This infrastructure provides services such as investment structuring, due diligence and sector expertise. This arrangement also enables costs to be reduced within the listed company. As a result of this arrangement, Paternoster is the only company listed on AIM or the London Stock Exchange that has exclusive access to this range of RiverFort services and its investment pipeline. Investors wishing to obtain exposure to RiverFort’s investment opportunities via a company listed on AIM or the London Stock Exchange will only be able to do so by investing in Paternoster. Paternoster’s shareholders approved the Investment Agreement on 08 June 2018. The Investment Agreement is for an initial period of two years after such time either party can terminate the agreement by giving one year’s notice. Going forward, it is the intention that at least 75 per cent. of investment funds available for investment will be invested in RiverFort arranged opportunities and no more than ten per cent. will be invested in pure equity investments. The ultimate investment decision with regard to any investment opportunity will, however, still remain with the Board of Paternoster. RiverFort is a highly-respected provider of specialist financing to the natural resources sector, providing equity, convertible debt and senior project finance solutions. RiverFort is the investment director of Cuart Investments PCC Limited, a Gibraltar Experienced Investor Fund. Since its formation, RiverFort has been able to arrange very attractive returns for its investors. In 2016, its first year of operation, Cuart Investments PCC Limited – Cuart Growth Capital Fund I achieved an increase in its audited NAV of over 15% between July and December 2016. , The increase in NAV for 2017, on an unaudited basis, is expected to be over 20%. From the date of its formation to 31 March 2018, RiverFort, on behalf of Cuart Growth Capital Fund I, its co-investors and other investment partners, has arranged over US$76 million of investments. The RiverFort team has an international footprint and a range of financial, entrepreneurial and industrial expertise. Riverfort is authorised and regulated by the Financial Conduct Authority. Continued Access to Equity and Debt Capital to Maintain Solvency and to Fund Operations. Excessive Cost of Available Capital – Interest Rate Fluctuations – Discounted Equity Offerings. Currency Volatility in the UK and in Currencies in Which the Company Invests. Perceived Oversupply of Certain Commodities. Operational and Development Cost Variability and Uncertainty. The Company’s ability to implement its investment strategy will be limited by its ability to identify and acquire suitable investments. Article 50 Withdrawal – The UK, as a member of the European Union, has triggered Article 50 to commence the UK’s withdrawal from the European Union. Therefore, any plans of the Company to invest in the European Union will have to be considered in line with such withdrawal and the consequences of making investments as a result. Success of the strategy not guaranteed – The Company’s level of profit on its investments will be reliant upon the performance of the assets acquired and the market for those assets. Dependence on Management – The Company’s ability to provide returns to Shareholders and achieve its investment objective is dependent on the performance of the Directors and its investment advisers in the identification, technical assessment, acquisition, management and disposal of investments in various target companies and projects. Scarcity of suitably qualified individuals – The Company’s ability to execute its Investment Policy depends on the successful recruitment and retention of talented and appropriately experienced and knowledgeable management. Potential loss on investments – The Company’s strategy carries inherent risks and there can be no guarantee that any appreciation in the value of an investment or acquisition will occur or that the objectives of the Company will be achieved.